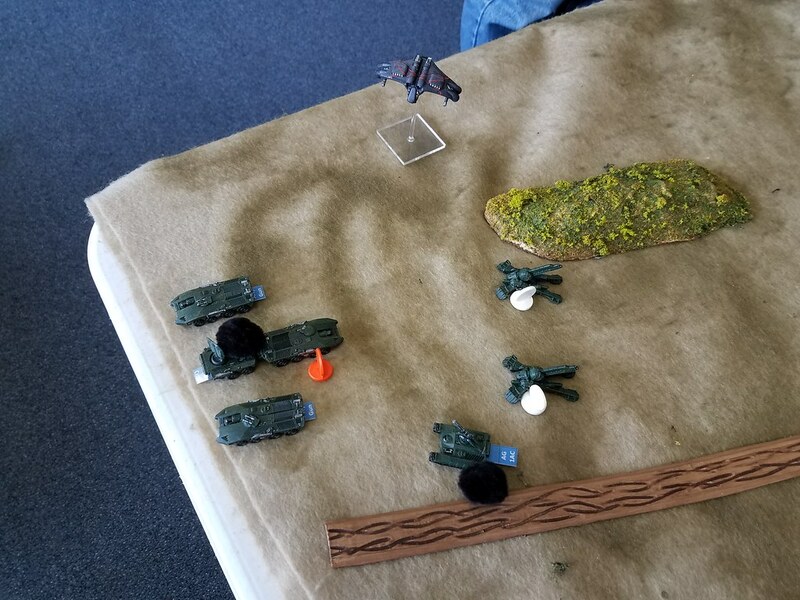 Ran a playtest for one of my upcoming games at Historicon. Retreating Minervan Defense Forces (MDF) were attacked by a small force of Colonial Development Union (CDU) mecha. 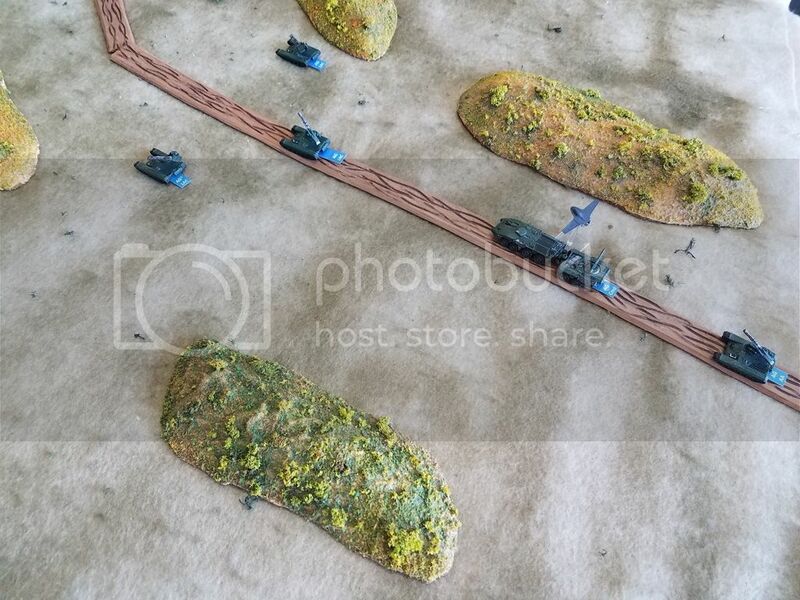 10mm figures from Dropzone Commander were used in a SciFi variant of Command Decision Test of Battle. The action was based on Beda Fomm 1941 in the western desert. The MDF advance guard moved straight up the road and were ambushed by CDU Mecha. Light CDU mecha moved to flank the advancing MDF column, but were chopped up by MDF tanks. MDF AA fire took its toll, downing two CDU dropships. 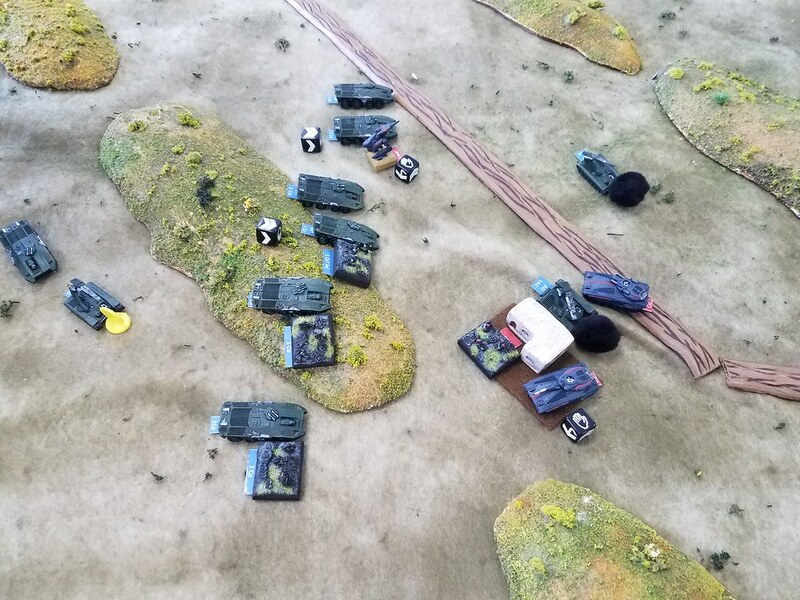 CDU mecha concentrated their fires to knock out MDF tanks, 4 tanks KO'd. 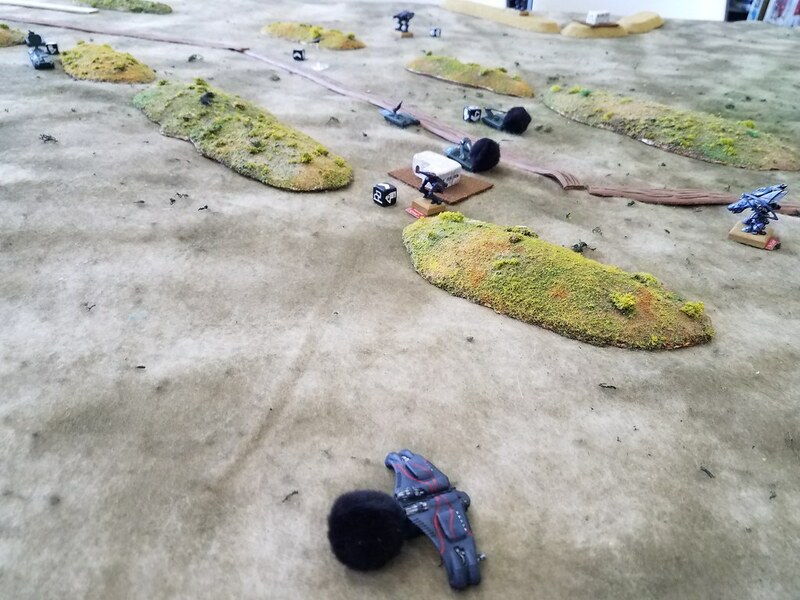 The MDF infantry buses charge forward only to be met with a wall of fire, to predictable results. The CDU dropships giving wide berth to the AA hit the supporting MDF artillery, suppressing and them off. 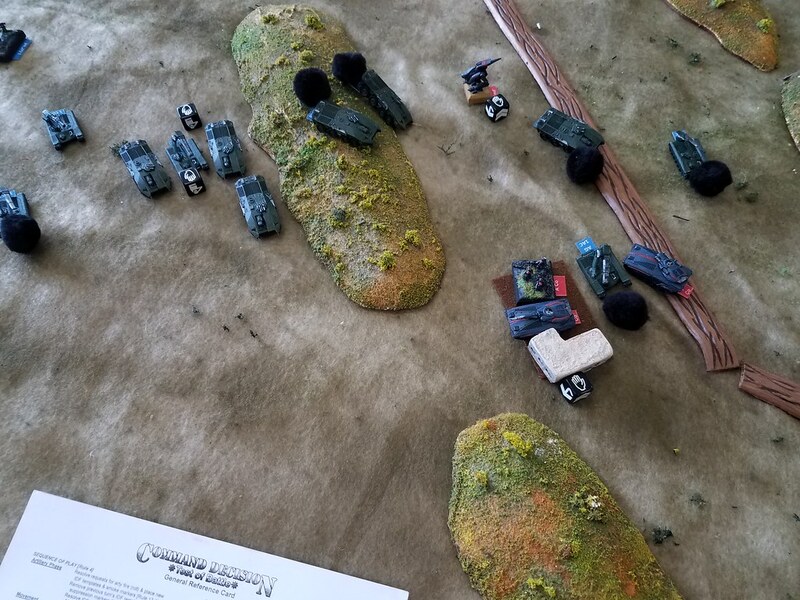 With most of MDF armor burning, the CDU was moving in for the knockout, and dust storm halted action. Select photos below. 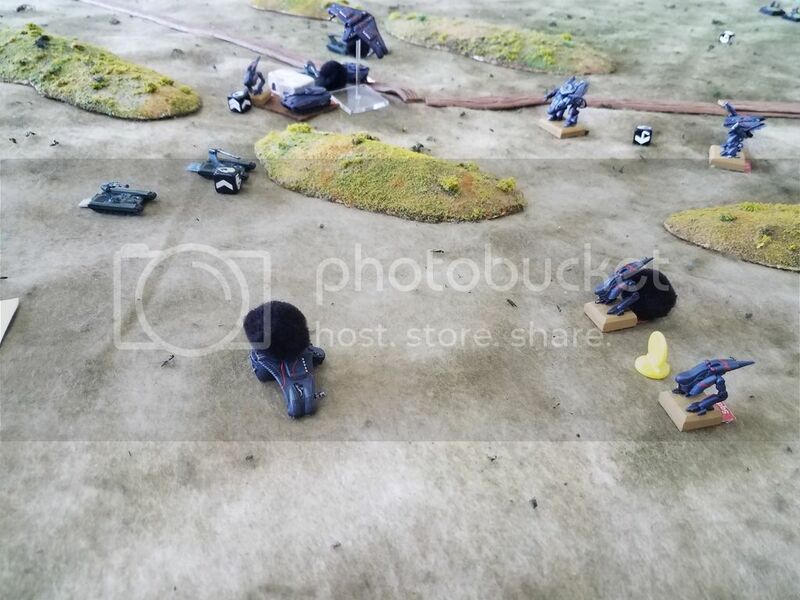 Photo 5 – CDU dropship downed by AA fire. Photo 7 – MDF APC's charge of the light brigade … with similar results. It was a fun game. 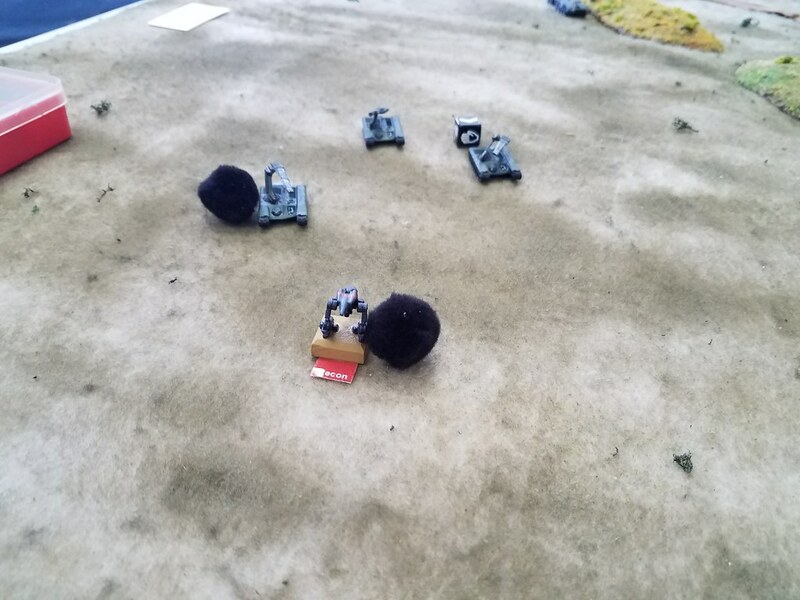 The big change to the CD rules in moving and firing air units during normal movement and fire phases, rather than in a separate air phase. Worked well. 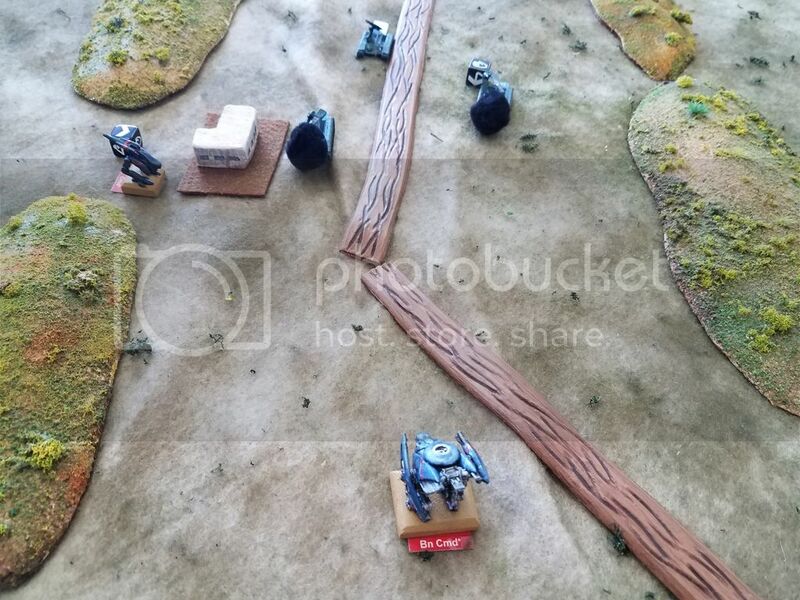 Game scheduled for Saturday at Historicon in the Pittsburgh BOG club room. Very interesting combination of rules, miniatures, and scenario! Beda Fomm is a fascinating battle, distorted by British propaganda, and now distorted by Italian enthusiasts and nationalists in the other direction in an attempt to rebalance the record, rebut characterizations of cowardice, etc. 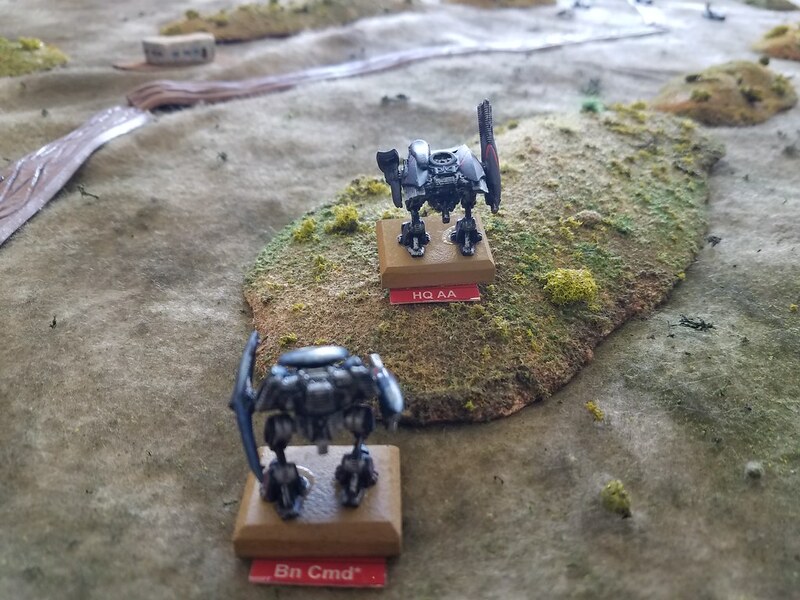 Retreating Minervan Defense Forces (MDF) were attacked by a small force of Colonial Development Union (CDU) mecha. 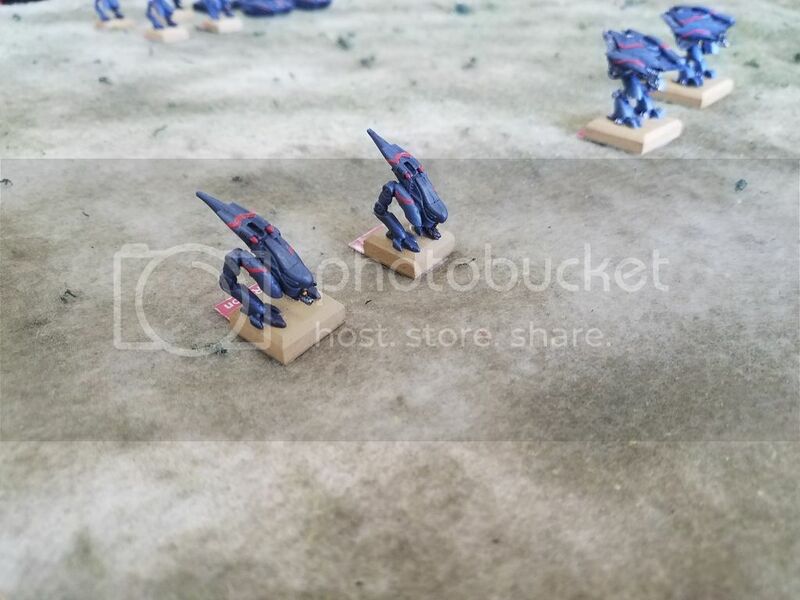 10mm figures from Dropzone Commander were used in a SciFi variant of Command Decision. The action was inspired by Beda Fomm 1941 in the western desert.